This last post will be relatively brief. 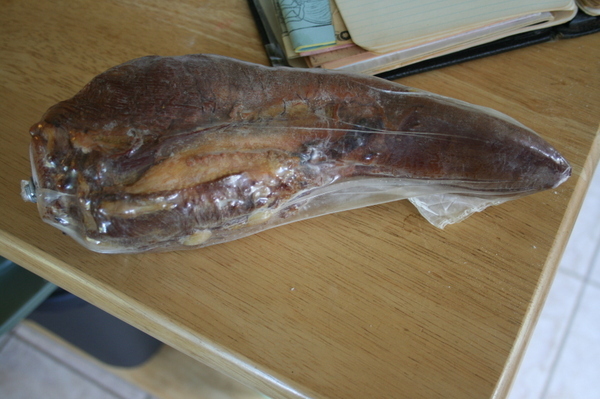 As I'd said in my first Oktoberfeast post, we ordered meats from Bavaria Sausage, Inc. out in Wisconsin. A variety of brats and wursts for the grill, and head cheese and beef tongue for the gross-out factor. Frozen and wrapped in plastic and surrounded by ice packs and styrofoam packing material. Here it is later - thawed and set out with some other appetizers. 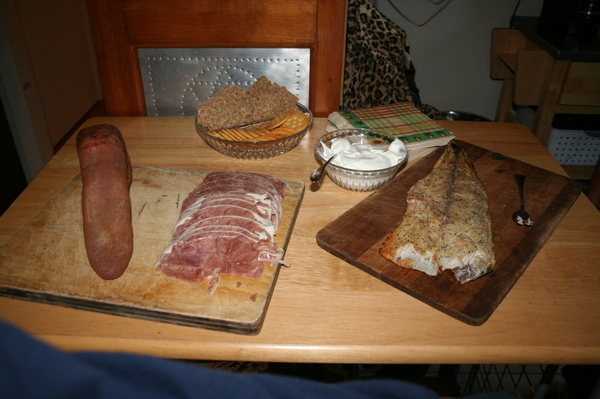 Left to right - the smoked tongue, the head cheese, sliced, and smoked bluefish that bill caught and smoked a few weeks prior. Behind everything are crackers and a bowl of sour cream. 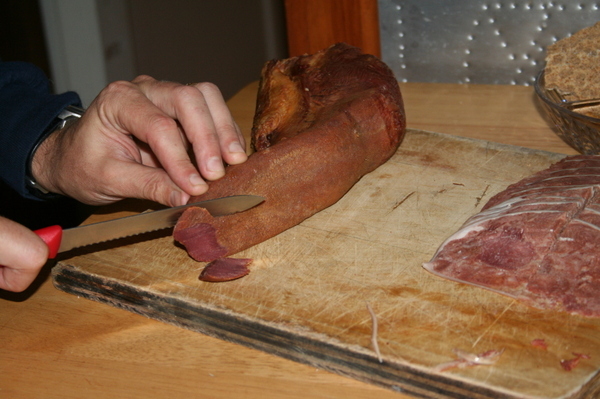 After people had arrived, Bill assembled everyone in the kitchen for the Slicing Of The Beef Tongue. It was everything he'd hoped it would be - some people were outwardly repulsed, others were kind of curious, and others patiently awaited the slicing so they could get on with the business of eating. And yeah, it's rather disturbing to watch. But you know what? 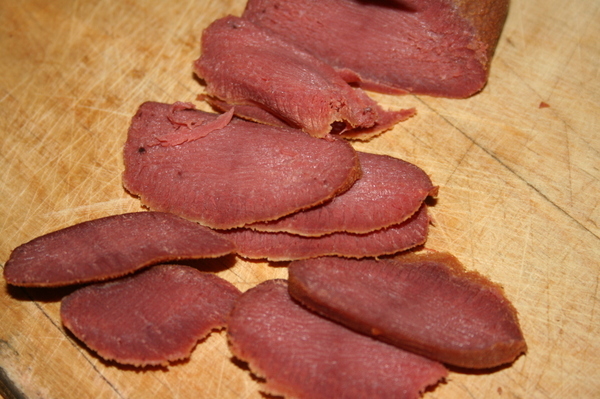 It was tender and had a nice smokey flavor and a texture also like corned beef. The main part of the tongue was nice and lean as you can see above. The back part was marbled with streaks of fat, and not quite as good on its own. I ended up making hash with it for breakfast one day, and it was perfect for that. And there you go. Not much else to report, really. We'll probably throw this dinner party again next year. It was fun!